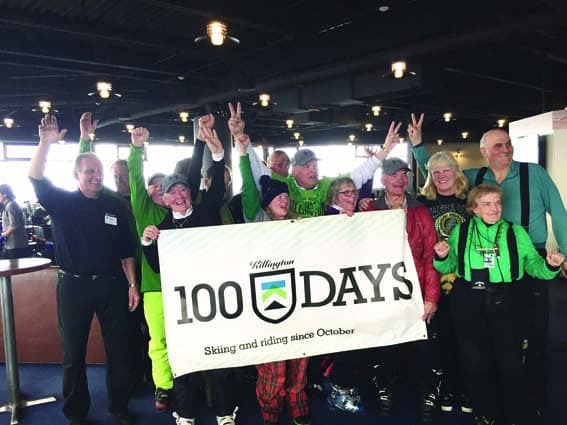 KILLINGTON — Killington Resort’s commitment to the longest ski and riding season in the East has helped the number of 100 Days Club members soar higher each year. Despite the unseasonable weather this season has brought, 28 skiers and riders have joined the 100 Days Club already this year, according to resort spokesman Michael Joseph, who added that many more will join before the season ends. In the 2012/2013 season, the first year the 100 Days Club was officially established, there were 132 members hitting that mark. The next year, 2013/2014, there were 137 members. Blessed with abundant natural snowfall last year, the 2014/2015 season, membership soared to 156. Many of the club members celebrated together at the Peak Lodge Thursday, March 17, for St. Patrick’s Day, including Don McNeil (132 days), Peggy Golonka (116 days), Larry Golonka (103 days), Cindy Bergstrom (107 days), and many other Killington loyalists including Nancy Finn and Michelle Fisher. Members of the Killington Client Service team also joined in the fun, including Tom Raybeck, Katie McFadden, and Sharon Glaser. In addition to celebrating St. Patrick’s Day they also celebrated Rob Kovalesky’s fourth consecutive year of enrollment in the 100 Days Club. Kovalesky, a charter club member, has skied a total of 486 ski days over the past four years. Fittingly for this season, Mother Nature also participated with thunder and lightning, providing an incredible light show for everyone in the Peak Restaurant. Killington’s 100 Days Club looks forward to welcoming and celebrating with all new and returning members.